Exciting news for data nerds! 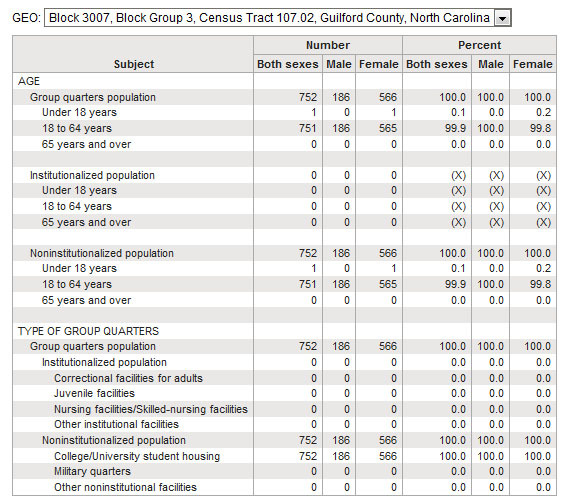 The US Census Bureau has released the 2010 Census Summary File 1 (SF1) data for North Carolina. This is the full release of data collected on the 2010 Census to the block level. 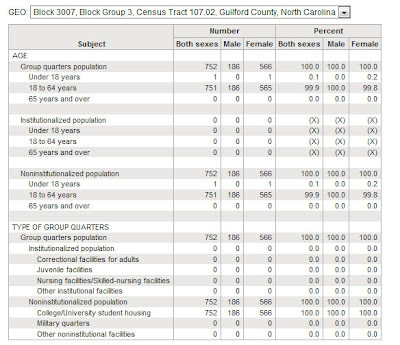 The 2010 Census Summary File 1 data for North Carolina is available through the new American Factfinder. And look! It's the UNCG block. And look at all of those gals! Could you tell UNCG is historically a women's college? The U.S. Department of Housing and Urban Development has created a helpful reference guide on HUD USER. It shows which datasets would have most to least relevance in a particular topic area (such as disabilities or demographics). 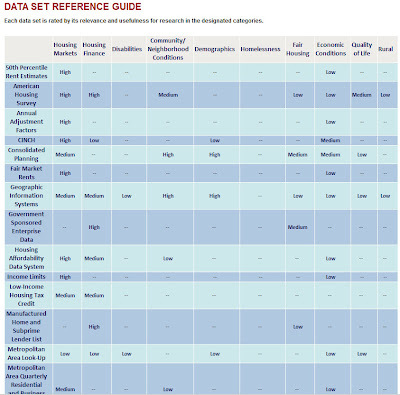 As reported by APDU: "The Data Set Reference Guide provides convenient, one-stop access to the original data sets generated by the Office of Policy Development and Research (PD&R), including data from the American Housing Survey, HUD median family income limits, microdata on housing discrimination, the HUD-insured multifamily housing stock, HUD’s assisted housing population, and other housing-related topics. 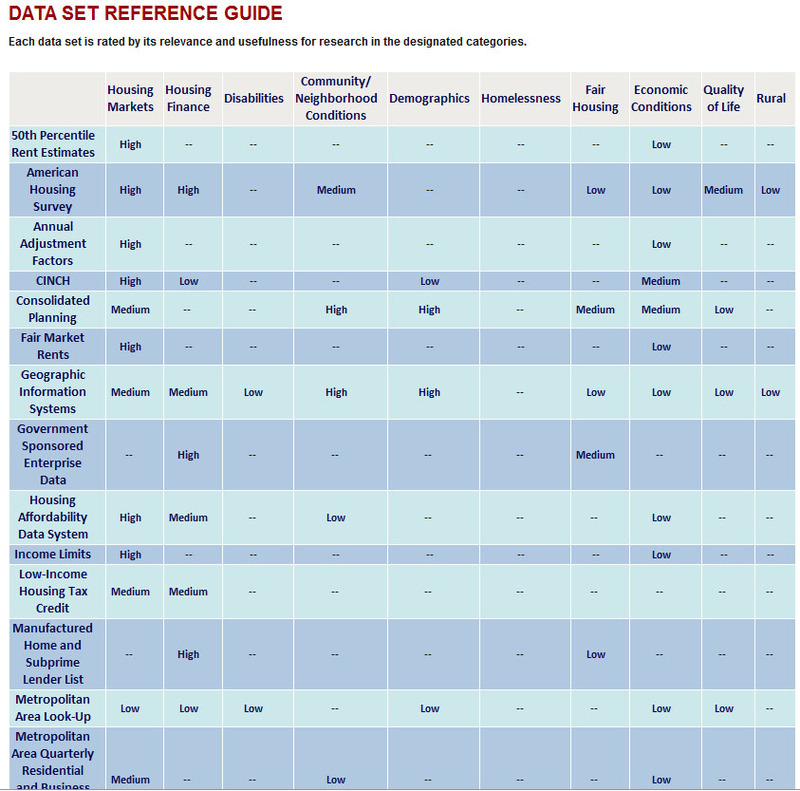 Access the PD&R guide here and a guide to other HUD data sources here." The Minnesota Population Center is pleased to announce the latest expansion of the IPUMS-International data series. We recently added 26 new samples. The data release includes 7 new countries -- Germany, Iran, Ireland, Jamaica, Malawi, Sierra Leone and Sudan -- as well as additional samples for 5 countries already in the database: Cambodia, Egypt, France, Palestine and Vietnam. The data series now contains 397 million person records from 185 censuses in 62 countries. You can get more detail about the latest data release at https://international.ipums.org/international/news.shtml#new_data_june2011 or go directly to the variable list to see the content of the new samples at https://international.ipums.org/international-action/variables/group. The data series can be accessed at https://international.ipums.org/international/index.shtml. We recently changed the way that users browse variables and make data extracts on our site. We welcome your feedback on this and any other aspect of IPUMS-International.